What’s It About? With the recent influx of successful foreign dramas from Europe, Arrow Films’ Nordic Noir label have delivered yet another fascinating series from Sweden – Anno 1790. Not your typical crime drama such as The Bridge or The Killing, Anno 1790 is a strange mix of historical drama and mystery, set just after the French Revolution. It’s a mesmerising twist on the crime drima, with flamboyant costumes and a naivety to its exploration that makes it far different to its modern day alternatives. Johan Gustav Dåådh (Peter Eggers) used to be a physician in the army and now investigates crime, using his own fascination with the French Revolution and science to fuel his passion for solving mysteries. He’s a well educated man, knows there’s more to life than what’s obvious on the surface, and is always looking to improve and expand on what he knows. With revolution in the air, there’s no better time to try and encourage change. On the opposite end of the spectrum is Simon Freund (Joel Spira), a man of God who prides himself on being a strong man despite his drinking, and who poses a real challenge to Dåådh. Beneath the surface these are both men who seek answers and change in their own ways, and Anno 1790 is a show with not only a heart but a political message too which sets it above many other dramas. Dåådh and Freund together are an intriguing mix of personalities and one which you’ll see develop over the episodes. To have such a mismash of ideas and subject matter, you could almost forgive Anno 1790 for being a little confusing, but actually it’s challenging in an entertaining way. Philosophical, political, and dramatic as well as being proud to represent history, Anno 1790 also has a romantic plotline between Dåådh and his superior officer Walhstedt’s wife Magdalena (Linda Zilliacus). There’s a lot more to the show than expected and it packs so much into a 10-episode series. Verdict: On the surface, Anno 1790 would seem a very strange and complicated show and could put unknowing viewers off, but give it a chance and it’ll draw you in to the mysterious world of Stockholm during a period of turmoil in Europe. The costumes and locations are beautiful and breathtaking in places, and enhance the depth of character and plot like no other. This is a show where attention to detail is paramount, but most importantly it’s not all style over substance. Under the detail is a strong plot and top-class acting. Dåådh especially is a man you can relate to – someone who sees things no one else does, and who wants to explore everything as much as possible. Watching him is a pleasure as you see him get closer to the hidden truths. Peter Eggers has a great range as an actor and really brings Dåådh to life and there’s a great chemistry between him and both Spira and Zilliacus. Extras: No extras on this DVD but the episodes alone speak for themselves. 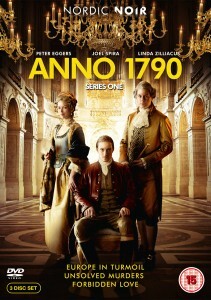 Final Words: Surprisingly addictive, Anno 1790 is one of those shows you shouldn’t judge by the cover. Open the box, play the discs and be mesmerised and enthralled by the efforts of those involved. This is a show where everything just clicks and makes for an addictive story that will leave you wanting more. Ten episodes certainly doesn’t seem enough and we live in hope that one day there’ll be more. I can’t recommend it highly enough to anyone who enjoys well written drama in a unique setting. Anno 1790 is out on 28 October 2013 on DVD.